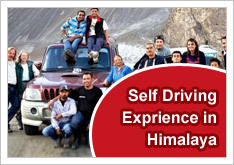 Adventure India Group operates only on those adventure routes which are personally experienced by its core team during last 14 years of existence. We don’t sell any adventure program based on secondary data. All the images on our website are clicked by our esteemed clients and we are thankful to them for their trust and belongingness. Goa- Madras Motorcycle tour on Indian Costal Lines - Riding Royal Enfield motorcycle, creating a royal noise and feeling pride for it , sitting straight on powerful bullet and enjoying the striking winds from opposite directions that increases with the increasing grip of your han More..
Rajasthan- literally, "Land of Kings" or "Land of Kingdoms” is a beautiful state of India that generally offers colors of culture, sand dunes of Thar Desert, wonderful markets, Havelis and Palaces and different festivals. It is located on the western side of More..
We strongly suggest you to use our email address info@adventureindiagroup.com for sending your queries directly to us. More..